“Brain”. It is supposed to be the crucial but also imaginary organ of this sculpture of Rodin. As physical, tangible reality, the brain is the most sophisticated and dazzling object of the known universe. I have one of those inside me. And you, by the very fact that you are reading these words, have another one. Another one of such amazing living diamonds. Do we own such a jewel or are we owned by it? “Brain”. The purpose of this philosophical dictionary is not to give meanings to words, is not to confine their semantics, but to calibrate their spell ability: their strength to configure contents of consciousness. Worlds. Let’s go now into a fabulous labyrinth of mirrors. One first step: Who or what wants to study, to see, to consider, to measure, to modelize, etc., the so called “human brain”? Who or what wants to create in its own brain an image, an idea, an atlas, of its own brain? Can the brain be object and subject of knowledge at the same time? It was reading Schopenhauer when I was dazzled for the first time by what is called “brain paradox”. It can be stated as follows: the brain, as a thing between things, is part of the world (like trees or snails or cars or stars). Seen like this, as a concrete cut of the visual impact of the world, it appears as something three-dimensional, tiny, vulnerable, and apparently created, configured and also pitiless submitted by the laws of Nature. But, on the other hand, according to Schopenhauer (who was a lover of Kant´s Philosophy), it is precisely inside the brain, and only there, where occurs that what we call “world”. If we do not philosophize (if we are not conscious of our thinking) we will not notice that we are identifying that what the neural connections of our brain are able to build and call “Brain”, with ‘that’ that is supposed to be surrounding the brain itself: the ‘outer world’, including it it, of course, the very matter of the brain itself and of the whole body itself. The theories of a neurophysiologist (if we accept and follow those same theories) are phenomena within the electrical and viscous inner-cosmos of their own galaxies of neurones. That inner-cosmos would be the habitat of the models of brain of a neurophysiologist. It could be said, from the current scientistic materialism, that the brain is one of the things that can be contemplated inside the brain if the brain works properly (inside that magic box can also happen an Autumn breeze that bristles the skin of memory). And from that materialism it can also be said that we will be more cognizant of the brain the closer we get to a certain neuronal conexions-path, to a certain form, or dance if you want, in the matter of our brain: the precise one that propitiates a suitable representation of what is the brain in itself. Let’s look at what is behind the word “brain”. Let’s do it with the infinite eyes of the Goddess Philosophy, which, according to neuroscience, is just a cerebral activity (the cerebral activity modelling itself, looking at itself… From where?). The word “brain” (that powerful logical ballerina) is going to give us a wonderful opportunity to philosophize seriously: without laziness, with extreme courage, ready to swim in the ocean of the infinite, of the unbearable even (but unbearable, sometimes, because of its extreme beauty). The great intellectual ecstasy of Philosophy begins. I truly believe that our philosophizing can receive an extremely fertile rain if we look at what is said about the brain from the current models of neurophysiology (from these determined configurations of the chemistry of our brain, if we accept those very models). But, what do those models say? I will focus on the human brain. As far as I know, it is said that the brain is a concrete part of the human body, an organ which is considered the centre of the nervous system. It contains billions of a special type of cells called “neurones”, which, amazingly, connect with each other, or not, creating, or not, clusters of connexions, or associations (let’s say societies). I have read that the neurones can cooperate in societies of millions of members and that it is still uncovered the mystery of the way that cooperation really works. It is also said that the brain tissue produces energy, electricity indeed (like a small, organic nuclear power station), which, if many neurones work together, can be powerful enough to get out of the skull (the box of the brain) and be measured outside. That organ, that crucial ‘machine’ [See “Machine”], is comprable with a computer. Actually, some current models of neuroscience use that comparison to improve their insight of the brain. And they do it on the grounds that the brain is a centre of perception and processing of data. The scope of such perception, as far as it is commonly accepted in today’s science, is quite amazing: light, sound, chemical composition of the atmosphere, temperature, head orientation, limb position, chemical composition of the bloodstream… The hypothalamus, which is one part of the brain, can even check the sodium level, the glucose level and the blood oxygen level, and send some of those outputs to the pituitary gland, which reacts introducing hormones into the bloodstream that are capable of changing cellular activity. It is also said that learning and memory are core activities of the brain. Santiago Ramon y Cajal might have explain such capacities arguing that they were just changes in the synaptic connexions between neurones. Such theory could have started to be fully proved by a stream of investigations triggered by a paper of Tim Bliss and Terje Lømo published in 1966 in Journal of Physiology. The key discovery of that paper was the so-called “long-term potentiation”: the strengthening of the synapsis between neurones caused by recent activity. There is also the opposite: the “long-term depression”. Both phenomena might be showing what is now called “synaptic plasticity”, which implies that the connexions between neurones can strengthen or weaken depending on their activity during a period of time. Thousands of millions of neurones capable, willing to connect among each other… What might occur if that total connexion takes place? The brain (that huge mystery) being completely conscious of itself? Philosophy, viewed from the current models of neurophysiology, could be described as a bomb of conscious thoughts set inside those galaxies of neurones in order to trigger its final, ecstatic connexion: the infinite synaptic plasticity. https://alleninstitute.org/what-we-do/brain-science/ . On the webpage of this institute (which was founded by Paul Allen, one of the founders of Microsoft along with Bill Gates) we are said what follows: “The human brain is the most complex piece of organized matter in the known universe. We use our singular approach to uncover its mysteries and share valuable resources with the global community of neuroscientists”. Our civilization is now fascinated with the human brains: with those complex pieces of organized matter. Inside those cosmic jewels might be the key of everything. 1.- Schopenhauer. The paradox of the brain. Let’s go back to it: the brain, as thing of the physical universe, is in space, but space (the continent, the ‘box’ of the physical universe) is only in the brain (Pararega and Paralipomena II, p. 48, according to the classic edition of Arthur Hübscher, revised by his wife Angelika, and published in Mannheim in 1988). The philosophical system of Schopenhauer overcomes such paradox placing the physical brain as part of the created world, as a kind of tool used by our deepest I in order to contemplate our own creation. 2.- Humberto Maturana. Biology of Cognition (Biological Computer Laboratory Research Report BCL 9.0. Urbana IL: University of Illinois, 1970). Maturana is one of the three creators of the concept “autopoiesis”, which refers to the alleged capacity of self-generating and self-maintaining of the so-called “living systems” (It is said that the other two creators of such concept are Francisco Varela and Ricardo B. Uribe). The brain: Maturana says the frog can not see all the animals (it does not see those that are especially large and slow). The activity of the brain is the result of the demands of the living system that nourishes it. Reality is made by living systems. Is it also the very theory that generates the brain of Maturana something (let’s say bio-artificial) that nurtures the living system that owes him? How can that theory be true if it is generated by a biologically enslaved brain whose sole purpose is to nourish something called “living system”? It deserves to be read the schematic study on the thought of Humberto Maturana offered by John Lechte in this work: Fifty Key Contemporary Thinkers: From Structuralism to Postmodernity (Routledge, London 1994). 4.- Antonio Damasio [See here, still in Spanish]: The error of Descartes. That error was to believe that the most refined operations of the mind are separated from the structure and functioning of the biological organism. The brain and the rest of the body constitute an inseparable organism composed of biochemical and neural regulatory circuits that relate to the environment as a whole, and mental activity arises from that interaction. So… Does our brain have the size of the whole physical universe? Do we think with all that? 5.- Richard Dawkins: The God delusion, 2006. In this book there is an epigraph that takes by title “The mother of all the burkas”. From the groove of his own burqa, and always through the kaleidoscopic lens of scientist materialism, Dawkins states that what we see of the real world is not the real world, but a model of the real world, regulated and adjusted by sense data (a model that is constructed in such a way that it is useful to deal with the real world). Dawkins also states that the nature of that model depends on the type of animal we are. According to that theory we could ask: Is not that very theory (the model of reality that Richard Dawkins exposes) just something useful that his brain (his body) needs in order to deal with the real world? 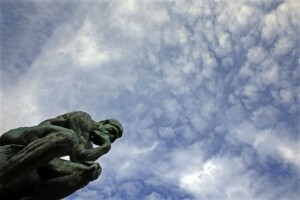 So: Do brains reflect reality or create it? Does the survival of the system require ‘reality’ reflected cerebrally or just fantasy capable of triggering will to live? [See here my full article on Richard Dawkings still in Spanish]. 1.- “Brain” is, first of all, a word. Nothing else. Nothing less… It can also be said that it is the result of applying a certain system of cuts in the visual reality of the so-called ‘universe’. I see no brain beyond a certain mental software (if we use the metaphor of Hilary Putnam). 2.- We are always bewitched by language. To see the exit, if you want, you have to be able to feel that both “atom”, “neuron”, “brain” and “science” are words: artificial fruits of mental models: secretions of something ineffable that, given that I am now inside a phrase, I have no choice but to name it ‘brain’. In fact, it is posible that in a very close future a new model of “brain” might emerge. For example a model that affirms the identity between what we now name “brain” and what we now name “universe”. 3.- The logical ballerina “Brain” usually dances together with another: “Mind”. It is said that from the last third of the twentieth century the philosophy of the mind is acquiring a privileged place in what we call philosophical reflection. But the leading idelogy nowadays is the one which asserts the material dimension of the brain. [See “Matter”]. Okay. But every physical object, according to current Physics (M-Theory), is supposed to have eleven dimensions, not only three. Therefore, the current models (the draws) of the brain are mutilated: the brain itself (even considered as a pure physical object) is impossible to draw. Impossible to see. Even impossible to imagine. 7.- The brain… I don’t really know what is that, but, if I close my eyes, I can feel it, ‘there’, like a huge magical, infinite whale. And I can also send it calm, silence, even love… That is something I do almost everyday. Believe me: After no more than one minute, that mysterious, unsayable ‘thing’ seems to be born again, ready to go on loving life, producing worlds if you want. The question is: From where do I feel my own brain? Where really am I? Enough. Let’s take Philosophy out of the dance room where the logical ballerina “Brain” needs to dance. That beautiful ballerina is part of a mighty dream: the dream of scientific materialism, which offers fabulous worlds, and fabulous expectations. This entry was posted in Philosophical dictionaries, Philosophy and tagged allen institute, and Programs", Antonio Damasio, Arthur Hübscher, Autopoiesis, Behavioral and Brain Sciences, Bill Gates, Biological Laboratory Research Report, Biology of Cognition, Brain, Brain paradox, Brains, Fifty Contemporary Thinkers, Francisco Varela, From Structuralism to Postmodernity, Hilary Putnam, Human brain, human brain project, Humberto Maturana, John Lechte, Journal of Physiology, Living systems, Long-term depression, Long-term potentiation, Microsoft, Minds, Neuroscience, Parerga and Paralipomena II, Paul Allen, Ricardo B. Uribe, Richard Dawkins, Rodin, Routledge, Santiago Ramón y Caja, Schopenhauer, Terje Lømo, The computational functionalism, The error of Descartes, The God Delusion, The mother of all bourkas, Tim Bliss, University of Illinois on 05/03/2019 by David.